Poor credit is something no one wants to be forced to deal with. However, since the housing market crash in the late 2000s, thousands of consumers are doing just that. Regardless, of how low your credit score, it is possible to improve it. But it will take a bit of time, patience and diligence. If you’re struggling with bad credit, you’re not alone — unless you’re not working on repairing it. Below are ways to repair bad credit, and help get you started in the right direction. Bad credit impacts consumers negatively. It makes it more difficult to obtain credit and forces them to pay higher insurance premiums. If you want to save money, you’ll need to start working on your credit history. Most consumers will put off doing this until the last minute. That’s because they know that it will be a difficult and ongoing process. However, if you’re looking for the security of knowing you can borrow money any time you want, you’ll need to jumpstart the process. The longer you wait, the more difficulties you’ll face. You may even lose your motivation to try somewhere along the way. The first step is to order a copy of your credit report. You’ll be happy to discover that every American consumer has the right to one free credit report every 12 months. This requirement means that the three primary credit reporting companies — TransUnion, Experian and Equifax — must provide you with a free copy of your credit report. You can do that on a single website, too. 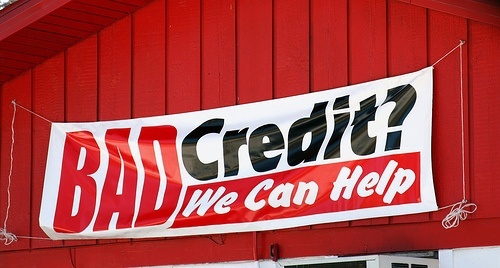 AnnualCreditReport.com is the only website authorized to provide an annual credit report from all three repositories. Once you receive the report, you will need to view it carefully. Focus on potential errors that can be corrected. Contrary to belief, companies can make mistakes when reporting information to the credit bureaus. If you have a sharp eye and the time to invest in viewing your credit report, you could very well find errors. These errors will have a negative impact on your credit, regardless of how minor they are. So do not quit until you’re satisfied there are no errors on your credit report. If you discover errors on your credit report, you’ll need to report them to the credit bureaus. If you don’t receive a response within 30 days of your initial report, contact the appropriate government entity immediately. Incorrect information or errors are the first things that need to be addressed on your credit report. Next you’ll need to focus on past due accounts. Those are accounts that have been charged off or show past due balances. If you don’t know how to go about doing this, you should immediately contact a legitimate credit repair company. However, choose the company wisely. Not all of these businesses have a reputation of helping consumers to improve their credit scores. Once you find past due accounts, you’ll need to write a letter to each of the companies that reported the information. The letter should address your desire to pay the account in full. Of course, you’ll probably not be able to pay the full amount in one lump sum. But many companies will be more than happy to set up a payment plan for you. Don’t stop with just a written notice of your willingness to pay off the debt. Call the creditors if you feel the need to do so. Believe it or not, charge-offs are the worst type of account status known to consumers. A charge-off is inevitable after the payment has reached 180-day past due. It’s unclear whether you should focus on the past due accounts that are getting ready to be charged-off or the current accounts that are past due. Don’t hesitate to contact your creditors determine exactly what you need to do to get back on track. Some creditors may be willing to spread the past due balances out over a period of time. Some may waive some of the late penalties. Both of these would be very beneficial to you, helping you work your way to getting these accounts current and eventually paid off.